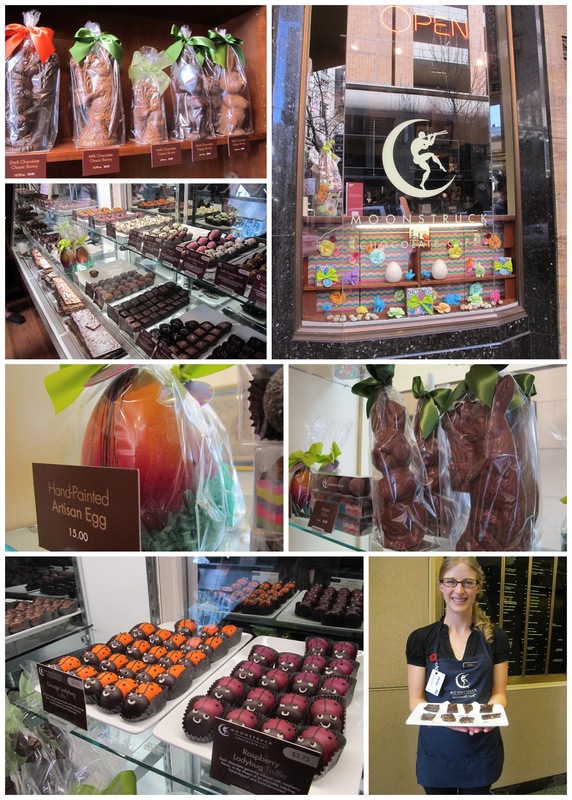 I realized that there couldn't possibly be a better day to do a chocolate tour than the day before Easter. OK, well maybe Valentines. But definitely after V Day the next one for chocolate is Easter. I'm in the Portland area helping my elderly parents move into their new home in Vancouver. After endless boxes and sorting, I need a break and a reason to blog. It was pure coincidence that a week before my trip I received an email for Portland Walking Tours, which include three that are food oriented. I opted for the Chocolate Decadence tour. This tour is $49, but I bought the ticket just the day before and it was slightly discounted to $46.99. You are given directions to park at the lot at Yamhill and 4th Ave, but this is several blocks away from the start and end points of the tour. My tip would be to look for parking between the two Cacao shops as that is where the tours start and end. You start at the Heathman Hotel and end at the 13th Avenue store. The Heathman Hotel is one of Portland's premiere hotels. You might recognize the name if you've read Fifty Shades of Grey. The tour meets on the mezzanine level in the Library. This day there were 16 attendees that were broken into two groups of eight, each with a guide. Our guide was Dianne and she started us off with flashcards and the basic information on how cacao is grown and prepped for shipping. We then went down to street level for our first stop. Cacao - Drink Chocolate is nestled in a small corner shop of the Heathman property. This is their smaller shop in the busier downtown area, not far from Pioneer Square. We are met by Sachiko who explains that their store doesn't focus on the creations of one chocolatier, but on showcasing specialty chocolates from around the world. 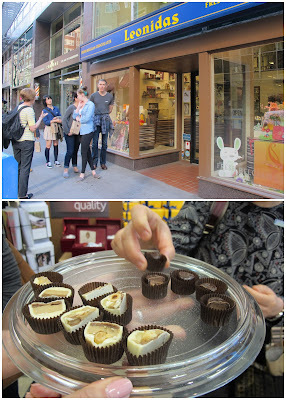 Their store is known for their drinking chocolates and we are each given a shot of their French style one. Other countries like Italy or Spain might add a thickener to get a really dense, thick drink, but the French like the smooth simplicity of just milk and chocolate. It was indeed smooth and luxurious, served at just the right warmth to slide down your throat. We moved to a surprising next stop, Benessere Oils. The shop is lined with an assortment of olive oils and balsamic vinegars in steel canisters. The bottles underneath are empty. You fill them from the spigotted containers. The balsamic vinegars sold here are true balsamics - properly aged and imported directly from the Modena region of Italy. We are here to taste three samples. First we taste the dark chocolate balsamic vinegar alone. It is has the tang of balsamic with the richness of cacao. You immediately wish you had a bowl of strawberries to drizzle this over. Next we are given the same balsamic with a bit of blood orange infused olive oil. The blood orange was pronounced and I pictured this over a baby greens salad. The last was the dark chocolate balsamic with a walnut oil. This was more earthy and closer to a liquid candy bar. I'm going to look into buying their Mix Any Six deal so that I can get six small bottles of anything I choose for $40. Moonstruck Chocolate was a short walk away. Moonstruck came to national attention when they were named as one of Oprah's Favorite Things in 2010. Started in 1993, they have become Portland's best known chocolatier. We are in their tiny store on SW Alder. (Why are all chocolate stores so cramped?) The store is so small, and this the day before Easter, that we are shuffled into the lobby of the building for our tasting. First we are given a sample of their Dark Chocolate Sea Salt Almond Bark. But it was the next sample that I enjoyed more. It was their tumbled chocolate covered blueberries. Now I happen to dislike fruit and chocolate, such as chocolate with berries or orange. I'm a nuts and chews girl. This jewel-like blueberry bite was wonderful. It was the dried Oregon blueberry covered in a rich, dark chocolate and it was simple and light, not overly sweet like I often find fruit/chocolate combos. Things only got better when our last tasting was a shot of their Mayan Milkshake, made with their Mayan chocolate and vanilla ice cream. It was served so thick that we had to turn the cups upside down over our mouths to get it to slip out. Note the chocolate ladybugs in the picture. Moonstruck is known for their truffle animals that change seasonally. Each take 36 hours to make. Here I buy a bag of chocolate covered hazelnuts for my dad. Little did I know that Portland is one of the few cities that have specialty European chocolatier stores from Switzerland and Belgium. I am a chocolate snob and really prefer European chocolates that use more cocoa butter than Americans typically do. I also adore Swiss chocolate shops, especially during the holidays. It's a real treat to walk into one in Geneva or Zurich during one of the holidays. I remember one in Zurich at Christmas time and being taken aback by the decorations of each chocolate, wrapped so pretty, to be used as tree ornaments. Now it was Easter and I was in the Swiss Teuscher Chocolate shop and there are beautiful Easter decorations. Each rabbit you see in the video is actually a gift box for chocolate. We are able to taste their famous champagne truffle and we learn about gianduja, which is a chocolate and fine hazelnuts. Unfortunately, at $88 per pound this store is way beyond my purse strings. The Belgians are represented too as we next move to the Leonidas Chocolate store. Dianne explains that the Belgians are particularly well known for their white chocolate, which is made using cocoa butter. Most white chocolate is adulterated with a lot of other ingredients and other fats as a way to lower cocoa butter content and cost. Belgians do not skimp on cocoa butter in their white chocolate. In fact, the Leonidas white chocolate bar wrapper even proclaims "100% cocoa butter". We are able to sample a white chocolate truffle and you feel that richness of the cocoa butter. I have fond memories of driving through Europe and our whole family often splitting a large white chocolate bar amongst us. It's for this reason that I make sure to buy a bar to take back to my father. It's time for a bit of a rest stop as we go to another famous, old Portland hotel, the Benson Hotel. Built in 1912 by lumber baron Simon Baron, it is known for having every US President but Obama stay there. We stop here for a chocolate cocktail at the bar. They do make a chocolate mocktail for those of us not drinking alcohol. Interestingly we learn that Mr. Benson was a noted teetotaler and donated many street-side water fountains throughout the city known as Benson's Bubblers. Our longest trek is the longest as we walk the several blocks to the larger Cacao as our final stop. 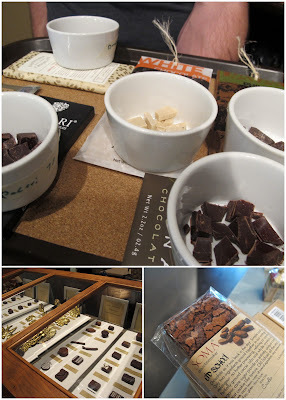 It is here that we are treated with chocolate bar tastings ranging from 100% chocolate down to 66%. They go from 100 to 60 as a way to not shock your tongue. To go from sweet to bitter would have more difficult for the tastebuds to discern the flavor notes. We taste bars from different chocolate origins such as Madagascar and the Philippines. Some have floral notes while others have more fruity ones. We end with a white chocolate from the Philippines that uses goat milk instead of cow and thus has a gamey, tangy flavor. I buy this bar too so that my dad can try two white chocolate extremes. For myself I buy an assortment of Mexican drinking chocolate rounds from Taza Chocolates. At first it had occurred to me that anyone could follow the steps of this post instead of taking the tour. But then I realized that even if you did, you wouldn't get all of the tastings that we had at each stop, let alone the background information and Portland history. One reason I signed up was because the summary had said I would have at least 15 tastings. Very true. And so I must admit, the tour was well worth the price. I certainly won't complain as I had my fill of chocolate the day before Easter! Sacramento - How Do I Love Thee?